If you’ve been injured by someone else’s negligent or intentional act, you have a set amount of time to file a lawsuit seeking a remedy for your injury. This time limit is known as a statute of limitations and it is outlined in Chapter 16 of the Texas Civil Practice & Remedies Code. In most instances, the statute of limitations for personal injuries is two years from the date of the accident or injury, meaning a lawsuit must be filed no later than two years from that day. Lawsuits filed after this two-year period will be summarily dismissed unless you meet one of the few exceptions to the statute. Missing this statutory deadline means giving up the ability to ever pursue a remedy (also known as damages) for your injury claim. It would have to be proven to the court that a person did not have the “mental capacity” to pursue litigation for a definite period of time. If you believe you have a personal injury claim it is better to seek out the advice of a qualified personal injury attorney sooner rather than later. 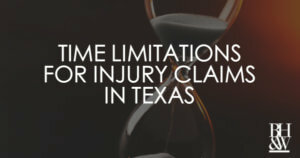 A Texas personal injury attorney can help you evaluate your claim’s statute of limitations and take steps to protect your rights.